Never miss a Cinemassacre video again! Often times we get e-mails from people that say they have not been notified of our newest videos. That’s probably because you have not clicked on the bell! 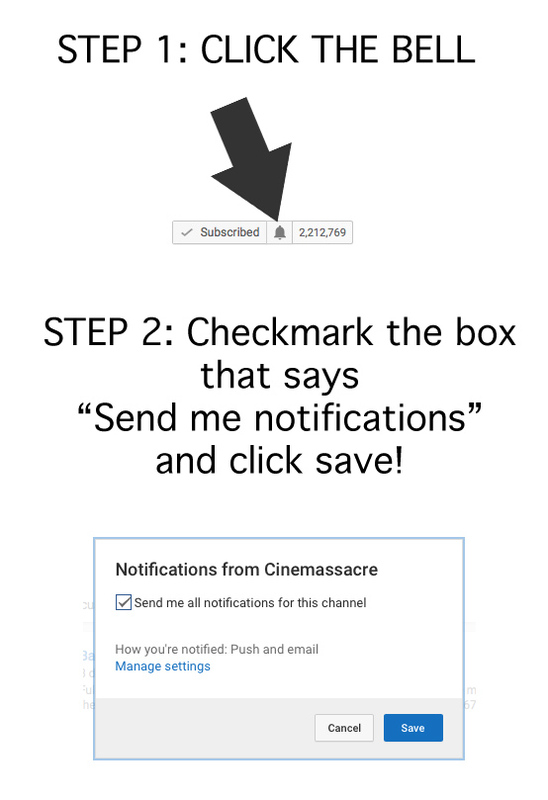 To get notified of every video Cinemassacre puts out, you must click the bell icon when you subscribe to our channel. Then, checkmark “allow notifications” and click SAVE. Never miss an AVGN episode or James & Mike Monday video again! Yay! Thanks Cinemassacre crew! You will not be missed! Your RSS feed works great, too! I actually unsubscribed a year ago or so, lol. Way too much videos for me, the Cinemassacre gang work like monsters. wow! i never knew that function existed! You know, even with that, there have been moments when I never receive a single notice on my email. If you have gmail it might be in “social”.